Just as today a woman's wedding was one of the most important days of her life. The major difference to Elizabethan wedding customs to a modern day Western marriage is that the woman had very little, if any, choice in who her husband might be. Marriages were frequently arranged so that both families involved would benefit. Marriages would be arranged to bring prestige or wealth to the family. The children of landowners would be expected to marry to increase the size of the acreage. A surprising fact is that young men were treated in a similar way as to women! Many couples would meet for the very first time on their wedding day! This particular Elizabethan custom usually applied to the nobility - two famous examples of the tradition of arranged marriage were between the tragic Lady Jane Grey and Guildford Dudley and King Henry VIII and his fourth wife Anne of Cleves. An Elizabethan Wedding Custom for the wealthy was to present a miniature picture to the man to give some indication of what his prospective wife might look like. This custom was followed prior to the betrothal of King Henry and Anne of Cleves. The artist was Hans Holbein who chose to disregard the plain looks of Anne and capture her kind personality. This particular example of an Elizabethan wedding custom totally back fired. The King was misled, could not escape the marriage and called his wife "the Flanders Mare". Needless to say he quickly arranged for the marriage to be dissolved in order to marry the 17 year old Catherine Howard ! 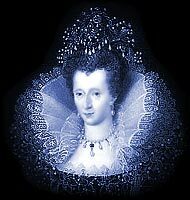 During the Elizabethan era of history women were very much 'second class citizens'. Regardless of their social standing they were expected to marry. Single women who were thought to be witches by their neighbours... Elizabethan marriages were sometimes arranged immediately following a babies birth via a formal betrothal. With parental permission it was legal for boys to marry at 14 and girls at 12 although it was not usual or traditional for marriages at such young ages. The age of consent was 21 and boys would generally not marry until this age. The dowry was an Elizabethan Wedding custom which benefited the husband. A dowry was an amount of money, goods, and property that the bride would bring to the marriage. It was also referred to as her marriage portion. The law gave a husband full rights over his wife. She effectively became his property. Arrangements for weddings would have been with the local church. Weddings were always a religious ceremony, conducted by a minister. The religions varied but the legal process prior to the wedding was always the same. There were no Registry Office marriages or marriages conducted by a Justice of the Peace. The first stage was Crying the Banns, announcing a couples intention to marry. The same procedure still applies to Church marriages in England today. The Elizabethan Wedding custom dictated that the couple's intention to marry had to be announced in the church three times on three consecutive Sundays or Holy days. This allowed time for any objections to be raised or pre-contracts to be discovered. Any marriage not published beforehand was considered clandestine and illegal. Wedding invitations were not issued. People lived in small communities and knew what was happening in common life. If there was an Elizabethan wedding then people would just attend. Gifts were occasionally given to the Bride and Groom. It was an Elizabethan Wedding custom to celebrate the marriage with a wedding feast. The special feast had to be carefully planned. The menu was discussed and arrangements for acquiring the content of the more exotic dishes, such a peacock, had to be made. The Elizabethans were keen on presenting dishes as attractively as possible - in the case of the peacock its colorful feathers would adorn the dish. Bread and sweetmeats would also be prepared. The staple drink of the Elizabethans was ale (water was unclean) but wine was also available and would have been ordered for the wedding feast. The bride did not wear a white wedding dress, this was a later tradition. Instead she would wear her best gown and kirtle , or even a new gown if the money was available. The gown would cover most of the body and would be full length. A cloak was used as an outer garment. Velvet, Satins and Corduroy were costly and therefore worn by the nobility. The wedding garments belonging to the majority of brides were generally made from Flax, Cotton and wool. Colours came in a variety of different shades: red, blue, greens, yellow, white, grey, black, orange and tan .Corsets were occasionally worn but any additional undergarments were rarely heard of. A shift, or chemise, would also be worn beneath the gown. Although the vast majority of the body was covered it was permissible for dresses to have plunging necklines. A necklace was often worn which drew even more attention to a woman's breasts. The necks and cuffs of gowns were decorated with silk or linen ruffs. Fresh flowers were central to the clothing. The bride would wear flowers in her hair and they would also adorn her gown. Unmarried girls were allowed to wear there hair loose but once married it had to be hid beneath a bonnet. Wealthy brides had garments which were adorned with jewels and gold and silver thread. It was also traditional to carry a bouquet. A bride would have bridesmaids and these would be similarly attired. The Bridegroom wore his best clothes which consisted of a doublet, breeches, hose, box pleated neck ruff and a cod piece. A cloak might also be worn and a pair of boots. Elizabethan men usually wore a short shift as an undergarment. Velvet, Satins and Corduroy were costly and therefore worn by the nobility. The garments belonging to the common man were generally made from Flax, Cotton and wool. Colours came in a variety of different shades: red, blue, greens, yellow, white, grey, black, orange and tan . Th e colour of yellow would not be chosen for a wedding - it was a sign of mourning. A bridal procession would move from the family's house to the church. This was a particularly festive event and the procession would be accompanied by musicians.